Australian Education truly international stature. Australian universities are linked to institutions in many countries and recruit faculty from around the world. After graduating in Australia, you can work in companies worldwide. Universities Australia will give you a solid knowledge in your chosen field of study along with the study skills can be applied to many other areas. You will not only learn about health, science, engineering or art but also learn how to think creatively and independently. System of higher education and postgraduate study in Australia including universities and public institutions and private independent activities provide the type and degree certificates. All educational establishments must be registered through the Diploma System (Australian Qualifications Framework - AQF) are allowed enrollment and degree. 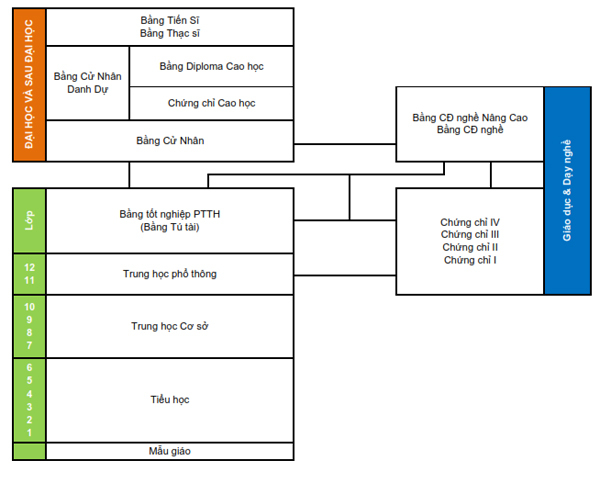 This is a system established by the Australian Government to link courses and degrees to each other and the guideline for the training, transition, assessment and awarding diplomas, certificates and lets students transfer to courses and other schools easily through the previously accumulated credits. While studying a degree in the AQF, you can trust that the institution is government authorized and qualified quality certification across Australia. AQF is a condition of your degree is the recognized foreign governments. When international employers see your degree, that degree that they represent: a foundation of world-class education in a modern society, democratic and advanced technology. In 2000, Australia passed the Law on the Education Services for Overseas Students (ESOS Act 2000). ESOS regulations every educational institution must meet the requirements to be able to register to receive students. All educational institutions to meet the registration requirements are published on the Agency Network of The Commonwealth Register of Institutions and Courses for Overseas Students (Commonwealth Register of Institutions and Courses for Overseas Students - CRICOS). The Australian universities are responsible quality management through the licensing process and the internal practices but also to comply with government regulations. All schools receive financial support from the Australian Government to meet the quality requirements of the Education Act, support and Graduate University in 2003. The quality of the university is guaranteed through regular inspections of the Quality Assurance Agency for Universities Australia (Australian Quality Agency Universitites - AUQA), an agency independent quality control at national, perform inspection activities of teaching, learning, research and management in Australian universities. Input requirements of each individual school curriculum by regulation. The college admissions are often based on a total of 13 years to complete high school, although some schools may request interviews, review of documents or gifted learners. Most schools have transition programs for students not leaving school (non-school leaver). The graduate admissions are made based on previous training programs of candidates. 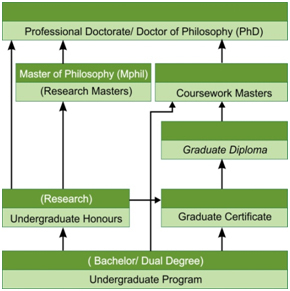 The admission to the Ph.D. program often based on outstanding academic achievement in the Masters program or previous research that the candidate has completed the program and achieved First Class BA Honours (80-100%) Honour or Second Class Division A (75-79%) to obtain a Bachelor of Honours. The enrollment period for undergraduate and postgraduate study in Australia was in February and July. MSc or PhD research can admission any time during the year. 1. The courses in Australia are varied and flexible. The country is developing advanced and currently offers over 17,000 courses from the College with Dr. main subjects: Business, Economy, Trade, Engineer, Engineering, Arts, Education, Law , Social Sciences, Design, Architecture, Information Technology, Medical, Pharmaceutical, Scientific ... to students in more than 100 countries and other countries to learn. 3. Australia has a whole set of laws that protect the rights of international students. The law aims to ensure students learn professional environment, quality, worthy of the cost paid. In addition, schools need support services to help students integrate easily with the environment and new learning. 4. In addition, international students have the opportunity to work in after graduation. For students completing the Masters program with study time 2 years or more, they can stay 2 years working in Australia. Particularly, the students completed Ph.D. course in study 3, they can stay in Australia 3 years and 4 years to apply for student completed Ph.D. course credits with a 4-year study period. 5. The learning environment in Australia and dynamic innovation. The school always students in learning and research and development of their thinking ability. The programs are examined and evaluated before being put into teaching, which helps meet the rigorous demands of the global labor market. 6. For students who have completed the Master course in the country, to study other Masters programs in Australia, or students who have completed the Bachelor to make the transition to the professional Master will be exempted course, that means the school will reduce the time and cost of learning activities for students. 7. For schools with cultural exchange programs, international exchange students, students with learning opportunities in Australia and moved to other countries to complete the rest. After finishing will return to Australia for the graduation exam. 8. Some high schools in the state public policy exemption or reduction of fees for the postgraduate students in Australia. As for the wife / husband of students can work full-time students are learning.